The cattle egret (Bubulcus ibis) is a cosmopolitan species of heron (family Ardeidae) found in the tropics, subtropics and warm temperate zones. It is the only member of the monotypic genus Bubulcus, although some authorities regard two of its subspecies as full species, the Western Cattle Egret and the Eastern Cattle Egret. The Eastern Cattle Egret (Bubulcus coromandus) is a species of heron (family Ardeidae) found in the tropics, subtropics and warm temperate zones. Most taxonomic authorities lump this species and the western cattle egret together as subspecies of the cattle egret, but some (including the International Ornithologists' Union) separate them. Despite the similarities in plumage to the egrets of the genus Egretta, it is more closely related to the herons of Ardea. 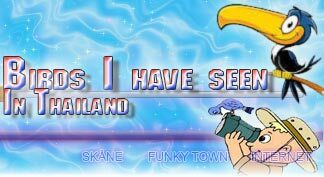 It is native to southern and eastern Asia, and Australasia. The Western Cattle Egret (Bubulcus ibis) is a species of heron (family Ardeidae) found in the tropics, subtropics and warm temperate zones. Most taxonomic authorities lump this species and the eastern cattle egret together (called the cattle egret), but some (including the International Ornithologists' Union separate them. Despite the similarities in plumage to the egrets of the genus Egretta, it is more closely related to the herons of Ardea. Originally native to parts of Asia, Africa and Europe, it has undergone a rapid expansion in its distribution and successfully colonised much of the rest of the world in the last century. It is a white bird adorned with buff plumes in the breeding season. It nests in colonies, usually near bodies of water and often with other wading birds. The nest is a platform of sticks in trees or shrubs. 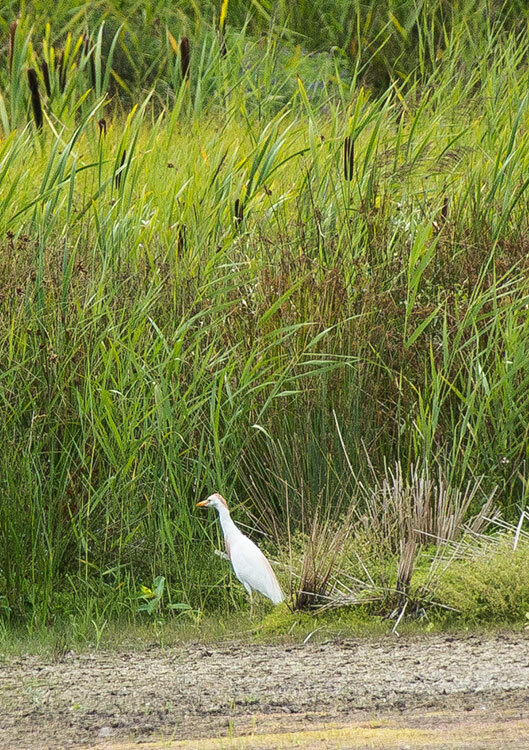 Cattle egrets exploit drier and open habitats more than other heron species. Their feeding habitats include seasonally inundated grasslands, pastures, farmlands, wetlands and rice paddies. They often accompany cattle or other large mammals, catching insect and small vertebrate prey disturbed by these animals. 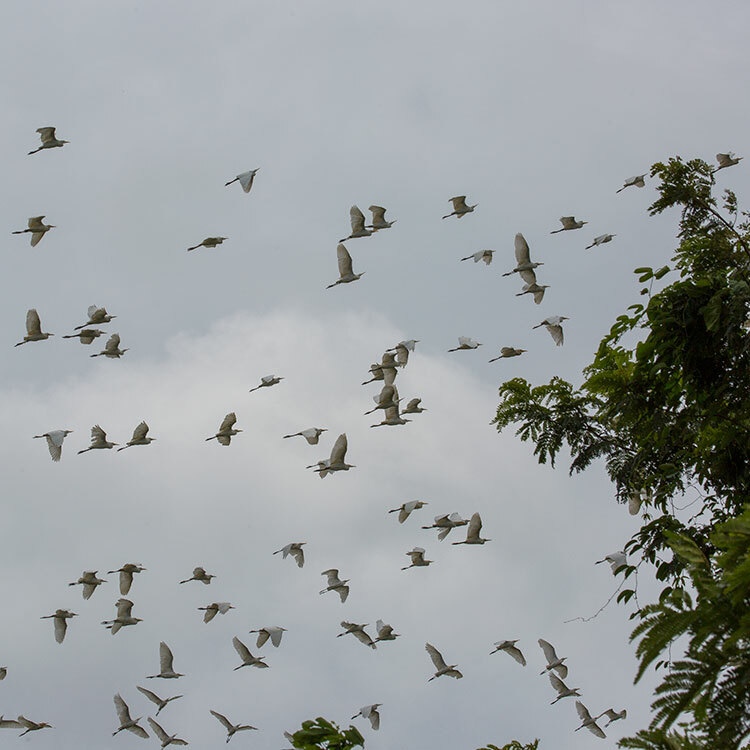 Some populations of the cattle egret are migratory and others show post-breeding dispersal. 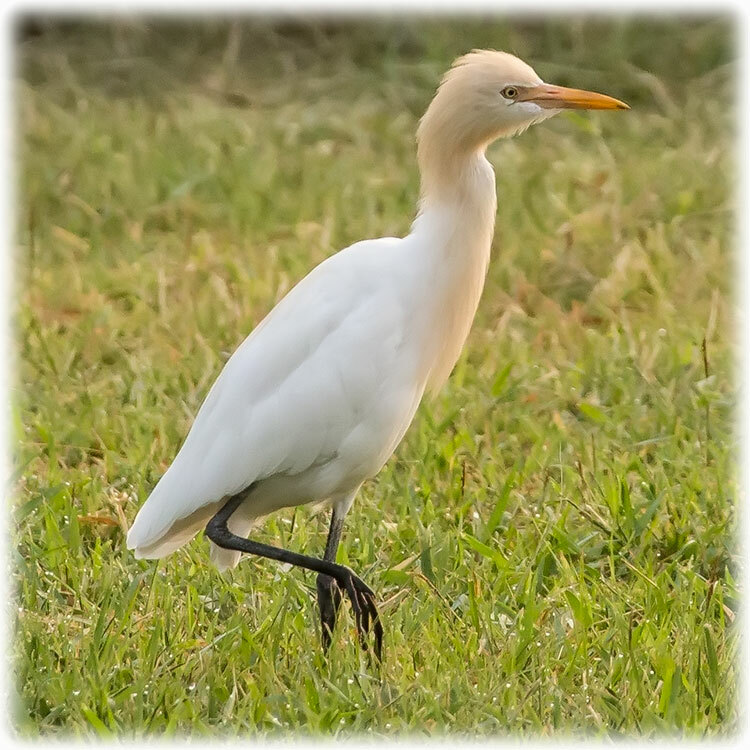 The adult cattle egret has few predators, but birds or mammals may raid its nests, and chicks may be lost to starvation, calcium deficiency or disturbance from other large birds. This species maintains a special relationship with cattle, which extends to other large grazing mammals; wider human farming is believed to be a major cause of their suddenly expanded range. 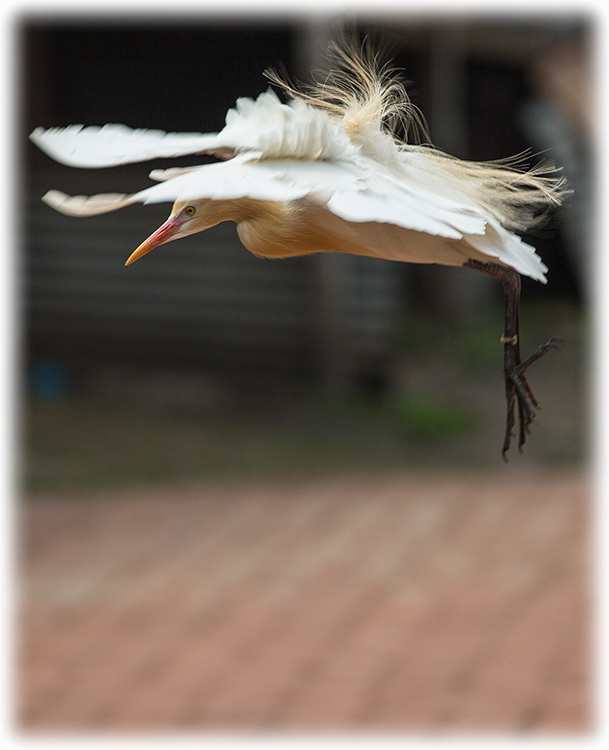 The cattle egret removes ticks and flies from cattle and consumes them. This benefits both species, but it has been implicated in the spread of tick-borne animal diseases. The cattle egret has undergone one of the most rapid and wide reaching natural expansions of any bird species. It was originally native to parts of Southern Spain and Portugal, tropical and subtropical Africa and humid tropical and subtropical Asia. In the end of the 19th century it began expanding its range into southern Africa, first breeding in the Cape Province in 1908. Cattle egrets were first sighted in the Americas on the boundary of Guiana and Suriname in 1877, having apparently flown across the Atlantic Ocean. It was not until the 1930s that the species is thought to have become established in that area. The species first arrived in North America in 1941 (these early sightings were originally dismissed as escapees), bred in Florida in 1953, and spread rapidly, breeding for the first time in Canada in 1962. It is now commonly seen as far west as California. It was first recorded breeding in Cuba in 1957, in Costa Rica in 1958, and in Mexico in 1963, although it was probably established before that. In Europe, the species had historically declined in Spain and Portugal, but in the latter part of the 20th century it expanded back through the Iberian Peninsula, and then began to colonise other parts of Europe; southern France in 1958, northern France in 1981 and Italy in 1985. Breeding in the United Kingdom was recorded for the first time in 2008 only a year after an influx seen in the previous year. In 2008, Cattle Egrets were also reported as having moved into Ireland for the first time. This trend has continued and Cattle Egrets have become more numerous in southern Britain with influxes in some numbers during the non breeding seasons of 2007/08 and 2016/17. They bred in Britain again in 2017, following an influx in the previous winter, and may become established there. In Australia, the colonisation began in the 1940s, with the species establishing itself in the north and east of the continent. It began to regularly visit New Zealand in the 1960s. 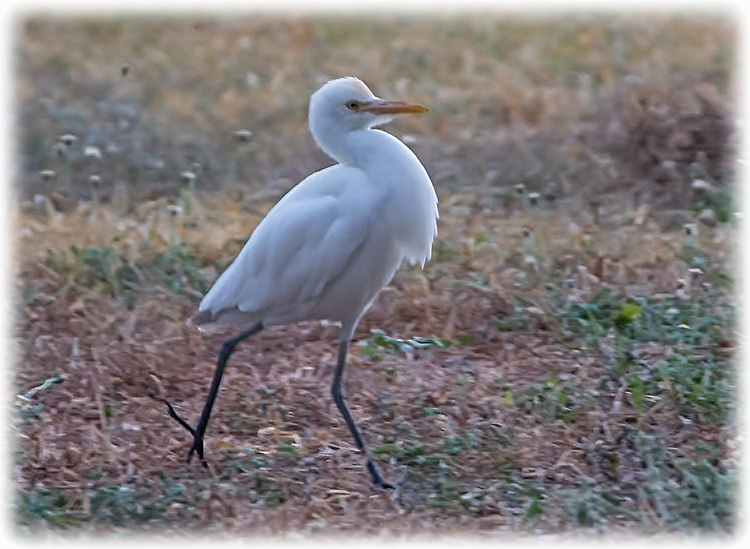 Since 1948 the cattle egret has been permanently resident in Israel. Prior to 1948 it was only a winter visitor. The massive and rapid expansion of the cattle egret's range is due to its relationship with humans and their domesticated animals. Originally adapted to a commensal relationship with large grazing and browsing animals, it was easily able to switch to domesticated cattle and horses. 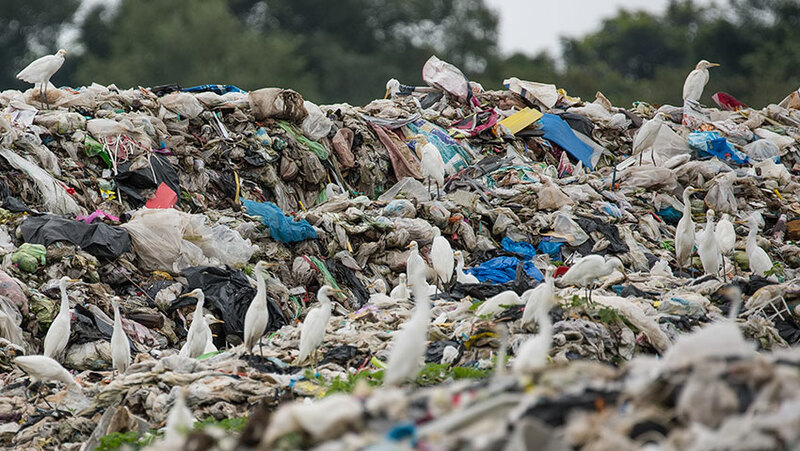 As the keeping of livestock spread throughout the world, the cattle egret was able to occupy otherwise empty niches. Many populations of Cattle Egrets are highly migratory and dispersive, and this has helped the species' range expansion. The species has been seen as a vagrant in various sub-Antarctic islands, including South Georgia, Marion Island, the South Sandwich Islands and the South Orkney Islands. A small flock of eight birds was also seen in Fiji in 2008. 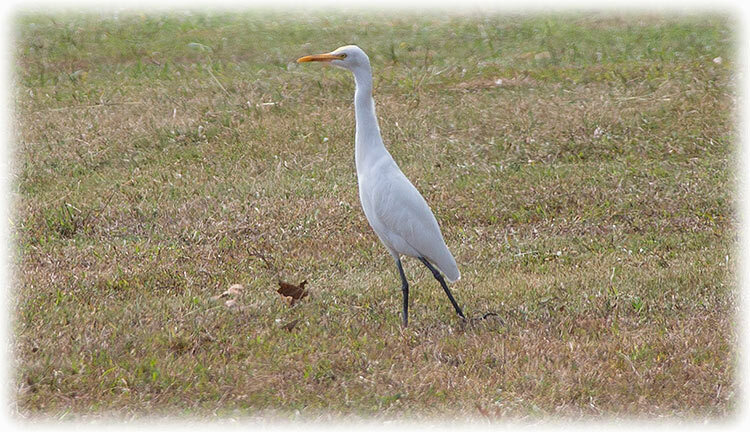 In addition to the natural expansion of its range, Cattle Egrets have been deliberately introduced into a few areas. The species was introduced to Hawaii in 1959, and to the Chagos Archipelago in 1955. Successful releases were also made in the Seychelles and Rodrigues, but attempts to introduce the species to Mauritius failed. Numerous birds were also released by Whipsnade Zoo in England, but the species was never established. The cattle egret was first described in 1758 by Linnaeus in his Systema naturae as Ardea ibis, but was moved to its current genus by Charles Lucien Bonaparte in 1855. Its genus name Bubulcus is Latin for herdsman, referring, like the English name, to this species' association with cattle. Ibis is a Latin and Greek word which originally referred to another white wading bird, the sacred ibis, but was applied to this species in error. The cattle egret has two geographical races which are sometimes classified as full species, the western cattle egret, B. ibis, and eastern cattle egret, B. coromandus. The two forms were split by McAllan and Bruce, but were regarded as conspecific by almost all other recent authors until the publication of the influential Birds of South Asia. The eastern subspecies B. 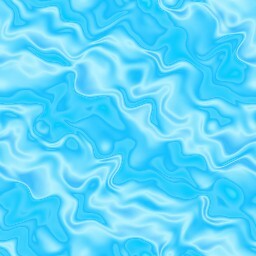 (i.) coromandus, described by Pieter Boddaert in 1783, breeds in Asia and Australasia, and the western nominate form occupies the rest of the species range, including the Americas. Some authorities recognise a third Seychelles subspecies, B. i. seychellarum, which was first described by Finn Salomonsen in 1934. 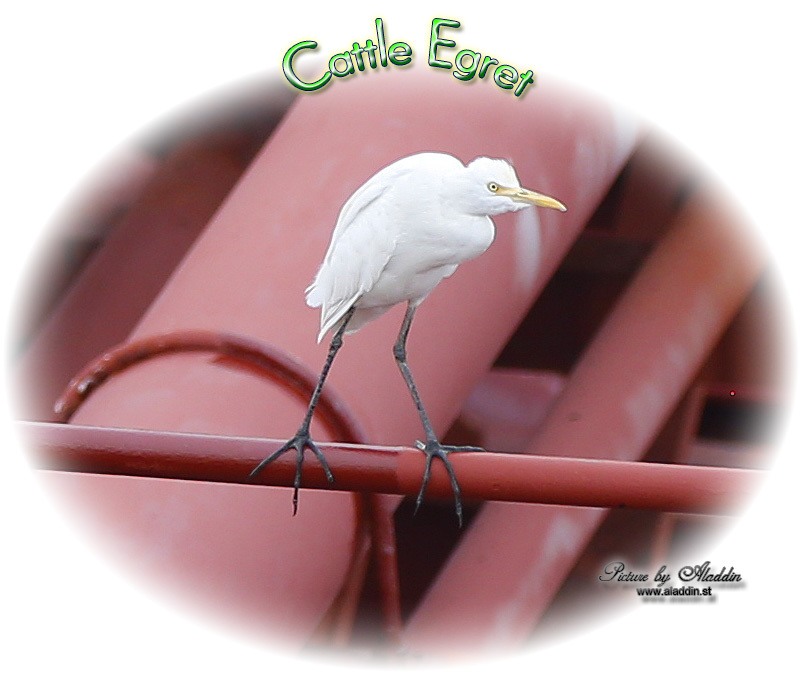 Despite superficial similarities in appearance, the cattle egret is more closely related to the genus Ardea, which comprises the great or typical herons and the Great Egret (A. alba), than to the majority of species termed egrets in the genus Egretta. 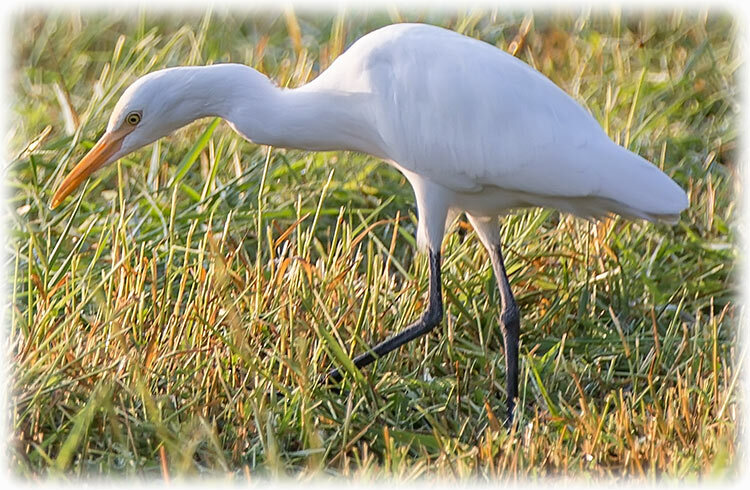 Rare cases of hybridization with little blue herons Egretta caerulea, little egrets Egretta garzetta and snowy egrets Egretta thula have been recorded. 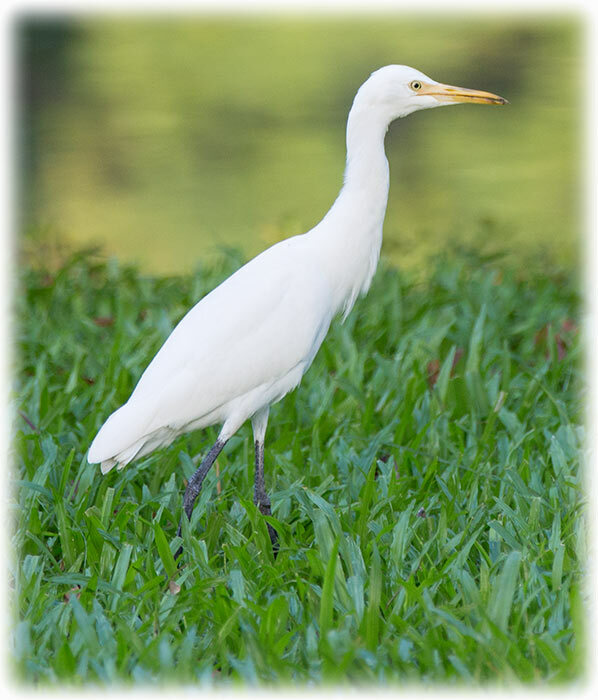 The cattle egret is a stocky heron with an 88–96 cm wingspan; it is 46–56 cm long and weighs 270–512 g. It has a relatively short thick neck, a sturdy bill, and a hunched posture. The non-breeding adult has mainly white plumage, a yellow bill and greyish-yellow legs. During the breeding season, adults of the nominate western subspecies develop orange-buff plumes on the back, breast and crown, and the bill, legs and irises become bright red for a brief period prior to pairing. The sexes are similar, but the male is marginally larger and has slightly longer breeding plumes than the female; juvenile birds lack coloured plumes and have a black bill. B. i. coromandus differs from the nominate subspecies in breeding plumage, when the buff colour on its head extends to the cheeks and throat, and the plumes are more golden in colour. This subspecies' bill and tarsus are longer on average than in B. i. ibis. B. i. seychellarum is smaller and shorter-winged than the other forms. It has white cheeks and throat, like B. i. ibis, but the nuptial plumes are golden, as with B. i. coromandus. Individuals with abnormally grey, melanistic plumages have been recorded. This species gives a quiet, throaty rick-rack call at the breeding colony, but is otherwise largely silent. Some populations of Cattle Egrets are migratory, others are dispersive, and distinguishing between the two can be difficult for this species. In many areas populations can be both sedentary and migratory. 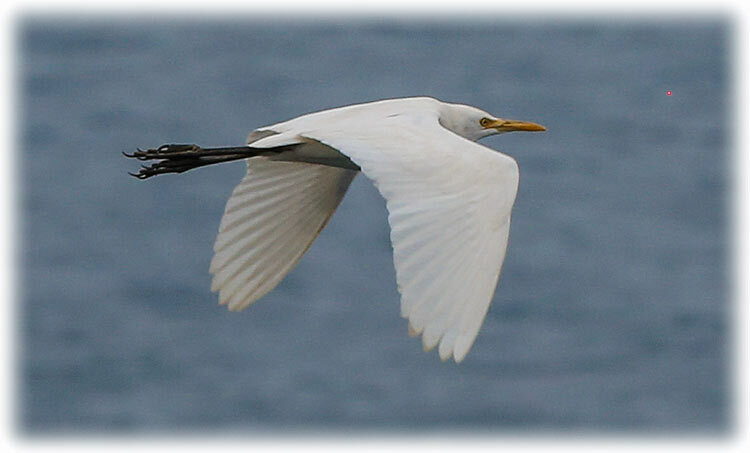 In the northern hemisphere, migration is from cooler climes to warmer areas, but Cattle Egrets nesting in Australia migrate to cooler Tasmania and New Zealand in the winter and return in the spring. 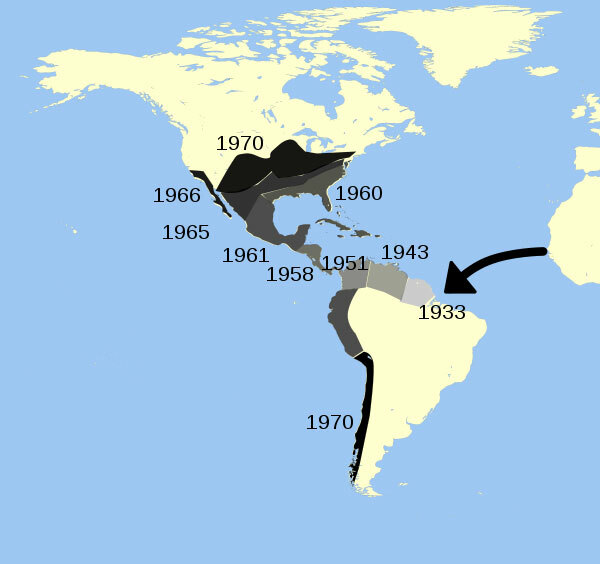 Migration in western Africa is in response to rainfall, and in South America migrating birds travel south of their breeding range in the non-breeding season. Populations in southern India appear to show local migrations in response to the monsoons. They move north from Kerala after September. During winter, many birds have been seen flying at night with flocks of Indian pond herons (Ardeola grayii) on the south-eastern coast of India and a winter influx has also been noted in Sri Lanka. Young birds are known to disperse up to 5,000 km from their breeding area. 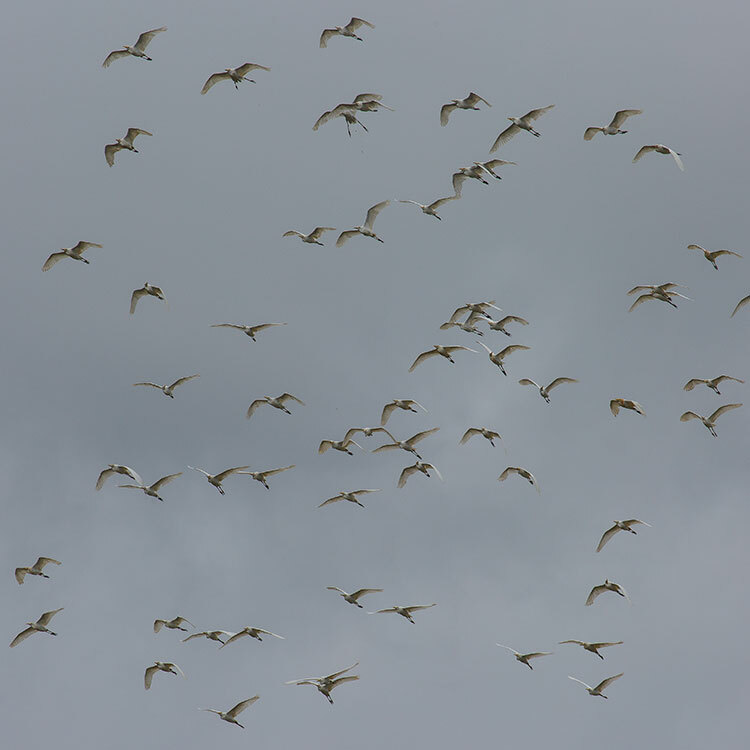 Flocks may fly vast distances and have been seen over seas and oceans including in the middle of the Atlantic. Status This species has a large range, with an estimated global extent of occurrence of 10,000,000 km2. Its global population estimated to be 3.8–6.7 million individuals. For these reasons, the species is evaluated as Least Concern. On the other hand, the expansion and establishment of the species over large ranges has led it to be classed as an invasive species (although little, if any impact has been noted yet). 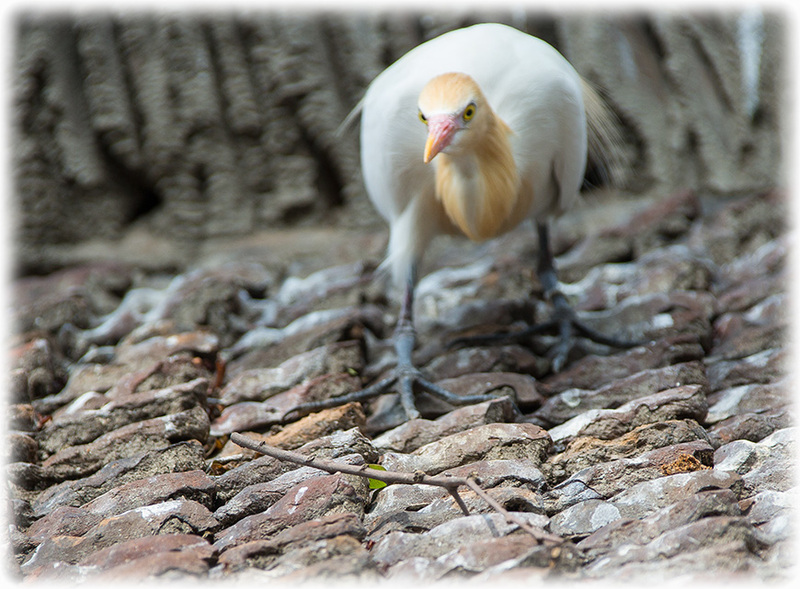 The cattle egret nests in colonies, which are often, but not always, found around bodies of water. The colonies are usually found in woodlands near lakes or rivers, in swamps, or on small inland or coastal islands, and are sometimes shared with other wetland birds, such as herons, egrets, ibises and cormorants. 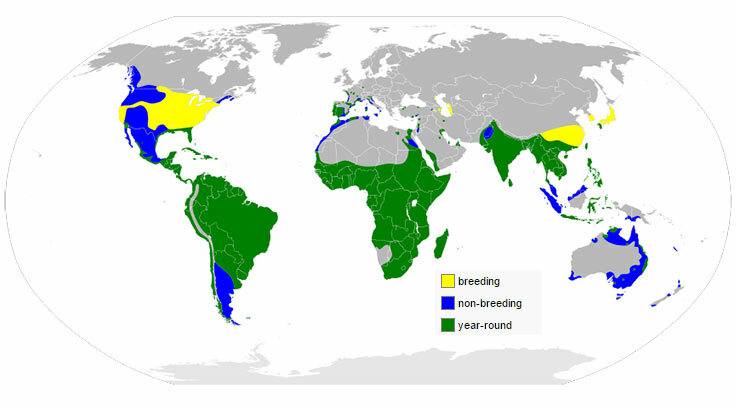 The breeding season varies within South Asia. 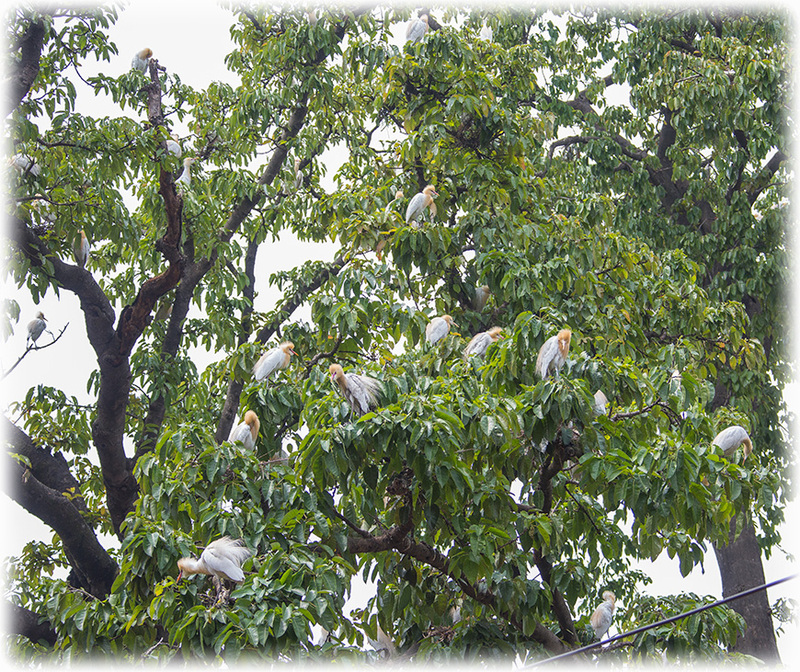 Nesting in northern India begins with the onset of monsoons in May. The breeding season in Australia is November to early January, with one brood laid per season. The North American breeding season lasts from April to October. In the Seychelles, the breeding season of the subspecies B.i. seychellarum is April to October. The male displays in a tree in the colony, using a range of ritualised behaviours such as shaking a twig and sky-pointing (raising his bill vertically upwards), and the pair forms over three or four days. A new mate is chosen in each season and when re-nesting following nest failure. The nest is a small untidy platform of sticks in a tree or shrub constructed by both parents. Sticks are collected by the male and arranged by the female, and stick-stealing is rife. The clutch size can be anywhere from one to five eggs, although three or four is most common. The pale bluish-white eggs are oval-shaped and measure 45 mm × 53 mm. Incubation lasts around 23 days, with both sexes sharing incubation duties. The chicks are partly covered with down at hatching, but are not capable of fending for themselves; they become capable of regulating their temperature at 9–12 days and are fully feathered in 13–21 days. They begin to leave the nest and climb around at 2 weeks, fledge at 30 days and become independent at around the 45th day. The dominant factor in nesting mortality is starvation. Sibling rivalry can be intense, and in South Africa third and fourth chicks inevitably starve. In the dryer habitats with fewer amphibians the diet may lack sufficient vertebrate content and may cause bone abnormalities in growing chicks due to calcium deficiency. In Barbados, nests were sometimes raided by vervet monkeys, and a study in Florida reported the fish crow and black rat as other possible nest raiders. The same study attributed some nestling mortality to brown pelicans nesting in the vicinity, which accidentally, but frequently, dislodged nests or caused nestlings to fall. In Australia, Torresian crows, wedge-tailed eagles and White-bellied Sea Eagles take eggs or young, and tick infestation and viral infections may also be causes of mortality. 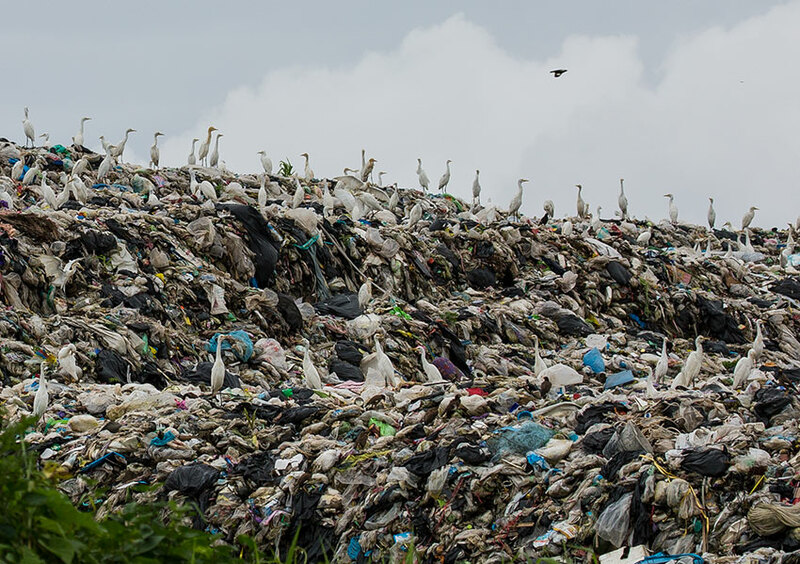 I have had people asking “what happened with all the Egrets and Herons?” You see them everywhere and suddenly, they are all gone. Not a Heron or Egret to be seen. Well, they are building nests and attending their young ones. 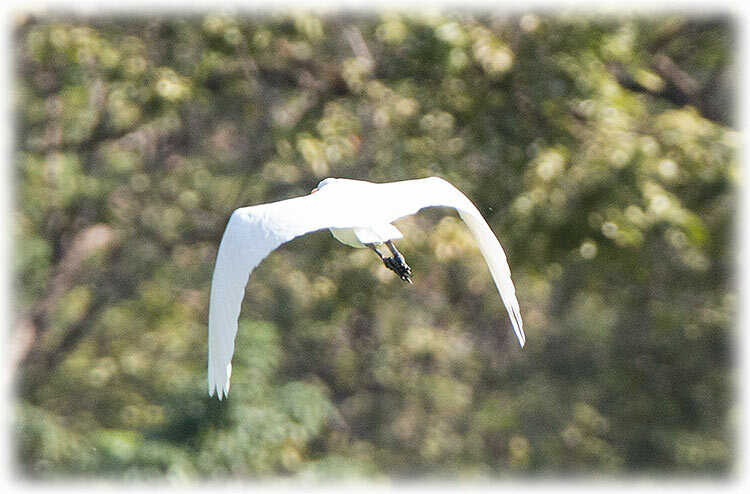 And this time of the year is an excellent opportunity to see and compare different Egrets and Herons. They are all sitting in a tree, and strangely enough, they all choose the same tree. Now I don't mean that all the Herons in the world fly to the same tree. 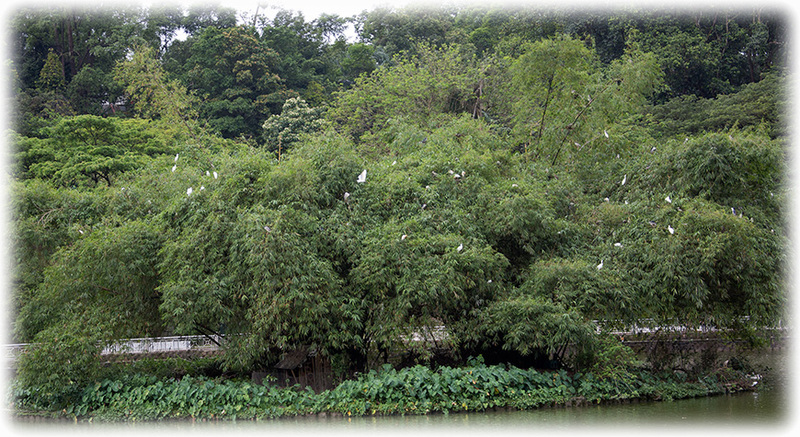 But all the egrets and herons in one area nest in the same tree. And if you're lucky to find one of the trees they are nesting in you can spend hours watching them. And if you live nearby you can see how their babies develops and when they start to fly the leave the nest, fly around the tree and crash land in to the nest( When they start to fly) of course, they get better. I like to see them building their nest. And I help them by collecting sticks and throw around the tree. Pure enjoyment to watch them picking up the sticks. And of course, this is an excellent photo opportunity. 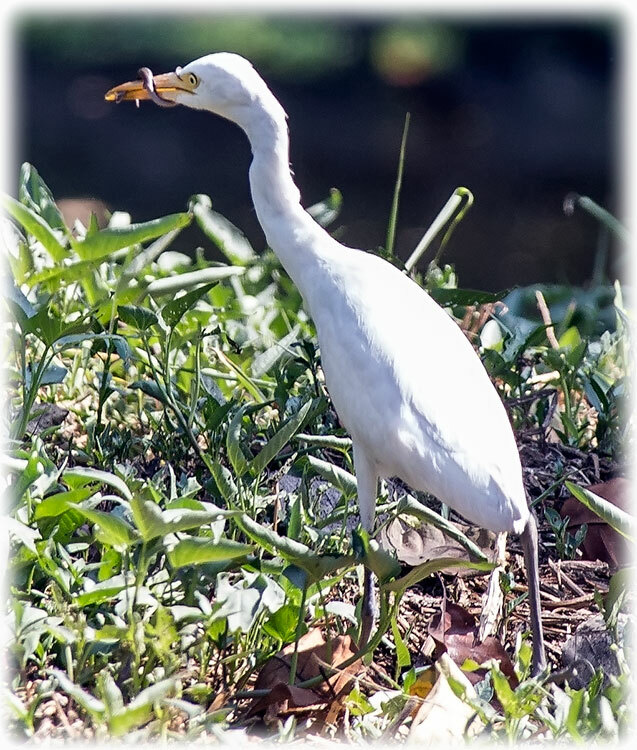 The cattle egret feeds on a wide range of prey, particularly insects, especially grasshoppers, crickets, flies (adults and maggots), and moths, as well as spiders, frogs, and earthworms. In a rare instance they have been observed foraging along the branches of a banyan tree for ripe figs. The species is usually found with cattle and other large grazing and browsing animals, and catches small creatures disturbed by the mammals. Studies have shown that cattle egret foraging success is much higher when foraging near a large animal than when feeding singly. 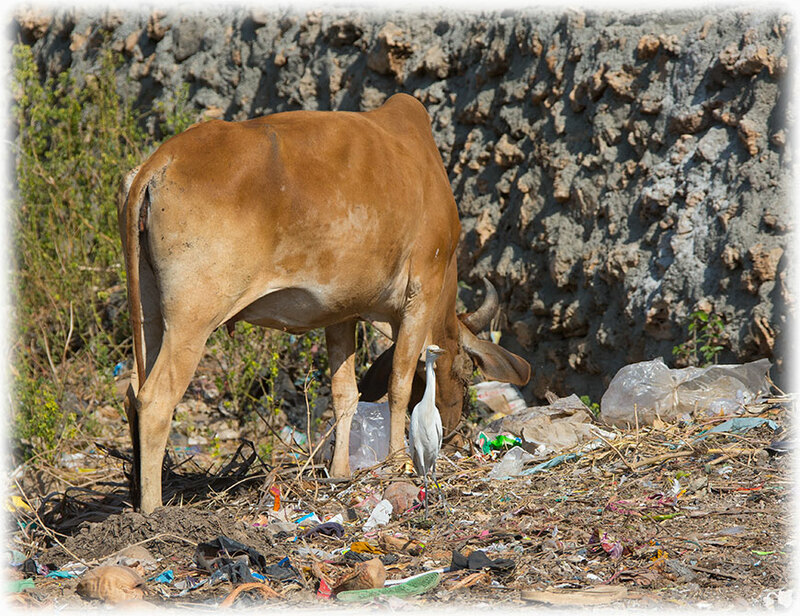 When foraging with cattle, it has been shown to be 3.6 times more successful in capturing prey than when foraging alone. Its performance is similar when it follows farm machinery, but it is forced to move more. 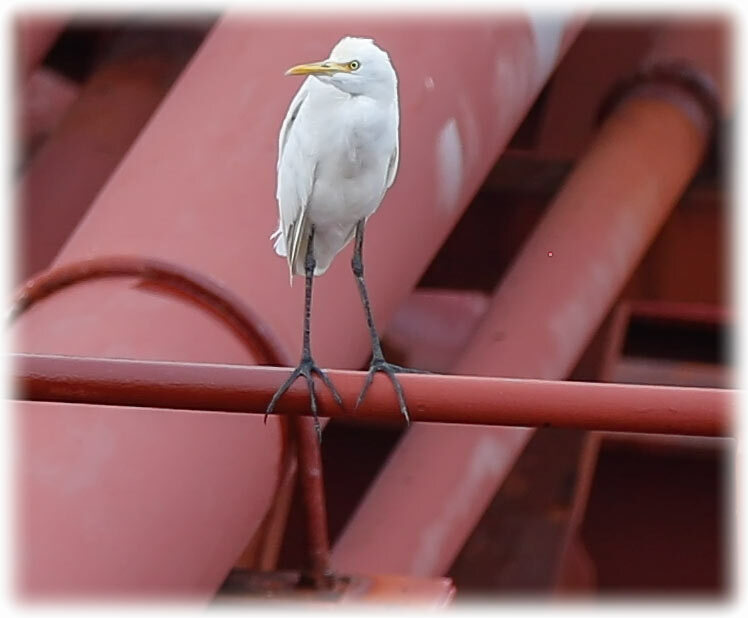 In urban situations Cattle Egrets have also been observed foraging in peculiar situations such as railway lines. 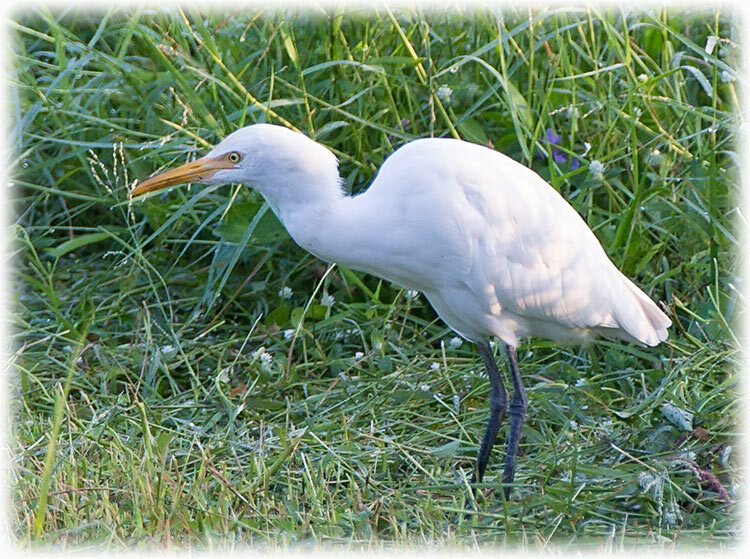 A cattle egret will weakly defend the area around a grazing animal against others of the same species, but if the area is swamped by egrets, it will give up and continue foraging elsewhere. Where numerous large animals are present, Cattle Egrets selectively forage around species that move at around 5–15 steps per minute, avoiding faster and slower moving herds; in Africa, Cattle Egrets selectively forage behind plains zebras, waterbuck, blue wildebeest and Cape buffalo. Dominant birds feed nearest to the host, and thus obtain more food. 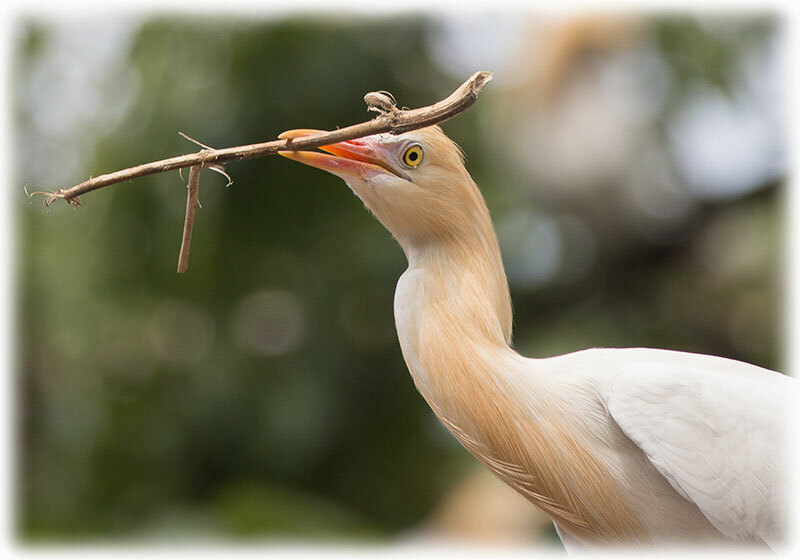 The cattle egret sometimes shows versatility in its diet. On islands with seabird colonies, it will prey on the eggs and chicks of terns and other seabirds. During migration It has also been reported to eat exhausted migrating landbirds. Birds of the Seychelles race also indulge in some kleptoparasitism, chasing the chicks of sooty terns and forcing them to disgorge food. A conspicuous species, the cattle egret has attracted many common names. These mostly relate to its habit of following cattle and other large animals, and it is known variously as cow crane, cow bird or cow heron, or even elephant bird or rhinoceros egret. Its Arabic name, abu qerdan, means "father of ticks", a name derived from the huge number of parasites such as avian ticks found in its breeding colonies. The Maasai people consider the presence of large numbers of Cattle Egrets as an indicator of impending drought and use it to decide on moving their cattle herds. The cattle egret is a popular bird with cattle ranchers for its perceived role as a biocontrol of cattle parasites such as ticks and flies. A study in Australia found that Cattle Egrets reduced the number of flies that bothered cattle by pecking them directly off the skin. It was the benefit to stock that prompted ranchers and the Hawaiian Board of Agriculture and Forestry to release the species in Hawaii.